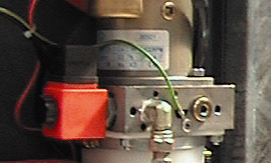 How to test, remove and refit the lowering valve solenoid on the Simpro Multi-Tip bin lifter. The solenoid should make a faint ‘click’ when the ‘Lower’ and ‘Safety’ buttons are pressed. If not, the fault may be either electrical or mechanical. If the wiring is OK, the red coil will act like a magnet when the ‘Raise’ and ‘Safety’ buttons are pressed (small piece of steel should be attracted to it). If the coil does not become magnetic, check the switches in the head, and other wiring. If the wiring is OK, check the coil itself. Remove the plug, then using a multi-meter in 200 ohms range, hold a probe on the two opposite terminals; it should give a reading of between 6 and 8 ohms. If the coil appears to be working properly, remove and check the valve as described in Pressure Relief Valve. Undo the knurled nut on the valve stem and remove the o-ring. Remove the solenoid coil, noting which way around it goes. Replace the correct way around, refit the o-ring and nut. The nut must be tightened to finger-tight only!